Easy wordsearch Bible books. 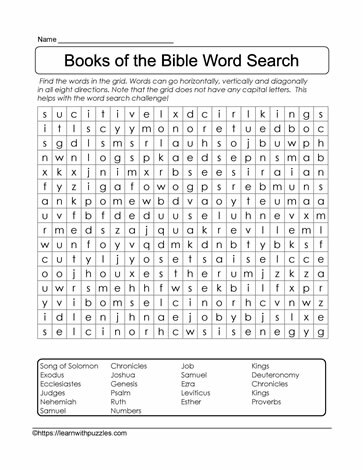 Here is a 19 word Bible wordsearch printable for downloading and printing. Suitable to use in regular classroom, Sunday School, and homeschooling environments. Students in late elementary grades 4,5,6 might benefit from this printable puzzle as it helps to consolidate understanding for books of the Bible and pattern recognition in word construction as they search for the different Bible words in the grid. Use this wordsearch printable as a tool to activate prior knowledge prior to the lesson plan, as a fun puzzle activity with students challenging each other to see who can be the first to complete the free puzzle, as well as an assessment tool. This assessment piece can be constructed by including open ended questions at the end of a unit about the books of the Bible. For example: To start, have students list at least one story from each of the books of the bible that are listed in the word bank. THEN, complete the wordsearch.